Letitia Gallery’s inaugural exhibition “Under the Same Moon” showcases a new body of paintings and drawings by British contemporary artist Eileen Cooper, who has been inspired by Lebanese history and landscape, tracing elegant linkages between nature, the body, and cultural history. The cedar trees of Lebanon are a particularly evocative presence in a new series of paintings and drawings that depict a multitude of relationships to this potent symbol. Mosaics also feature strongly, speaking to the intricacies of Lebanese art and design with which Cooper is in dialogue. "Under the Same Moon" has been inspired by Lebanese history and landscape, tracing elegant linkages between nature, the body, and cultural history. The cedar trees of Lebanon are a particularly evocative presence in a new series of paintings and drawings that depict a multitude of relationships to this potent symbol. Mosaics also feature strongly, speaking to the intricacies of Lebanese art and design with which Cooper is in dialogue. Lives and works in London, UK. From 1971 to 1974, Cooper attended Goldsmiths College and later went on to graduate from the Royal College of Art in 1977. During the 1980s, she quickly became established and exhibited widely. 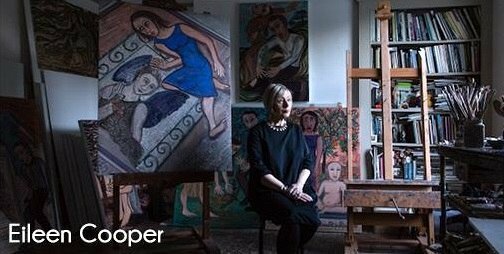 Cooper became Royal Academician in 2000 and, in 2010, was elected Keeper of the Royal Academy, becoming the first woman in this role since the Academy was founded in 1768. Alongside developing her practice as an artist, Cooper has taught part-time as a visiting artist and educator in numerous institutions including St Martins School of Art, Royal College of Art and the Royal Academy Schools. She has held solo exhibitions in The Fine Art Society, London, UK (2017); Wolfson College, Cambridge, UK (2016); Galerie Miro, Prague, Czech Republic (2016); Royal Academy of Arts, London, UK (2015); Art First Gallery, London, UK (2013, 2010, 2009, 2007); Art First Projects, New York, US (2003, 2002); and Dulwich Picture Gallery, London, UK (2000). She has participated in group exhibitions including The Royal Academy Summer Exhibition, London, UK (2017); Drawn Together: Artist as Selector, Jerwood Gallery, Hastings, UK (2014); Encounter, The Royal Academy in the Middle East, Doha, Qatar (2013) and The Royal Academy in Asia, Singapore (2012); and The Outsider: British Figuration Now, Palazzo Vecchio, Florence, Italy (2001).